While Ann was an undergraduate at Tufts University majoring in German, she took advantage of the opportunity to spend her junior year studying at the University of Tubingen, one of Germany’s oldest and most famous universities. It was there in 1968 when she met a young Scotsman, J. Derrick McClure. He had already completed his M.A. in English Language and Literature at Glasgow University two years before and was working toward an M.Litt. in Linguistics, specifically in Phonetics, at Edinburgh University, which he would complete two years later. 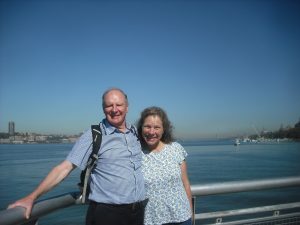 Derrick was a Lektor in Englische Phonetik at Tubingen when he and Ann met. It was at a St. Nicholas Night party of the Anglistische Seminar, on 5 December 1968. As Derrick described her, she was a “stunning golden-haired American girl.” Looking back on that time, Ann said she looked more German than the Germans. 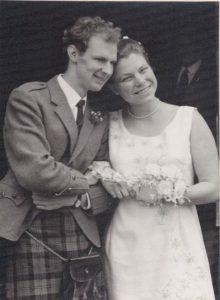 One thing let to another and after Ann graduated from Tufts, she and Derrick were married on 4 July 1970 in the Trinity Church (now called St. Columba’s Church) in Ayr, Scotland, where Derrick had grown up. Their first two years of marriage were spent in Ottawa, Canada where Derrick was teaching at Ottawa University. Looking for a permanent position, preferably in Scotland, Derrick sent enquiries to various Scottish universities. It was the University of Aberdeen, founded in 1495 as Scotland’s third oldest university, that responded with an invitation to apply for a planned lectureship in the English Department for a specialist in Scots. Derrick began teaching at Aberdeen in September 1972. 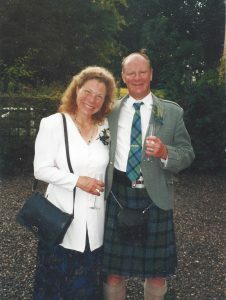 Wedding of Ann Bolinger to J. Derrick McClure of Ayr, Scotland. There soon followed the birth of three sons, Bruce, Ewan, and Alan. 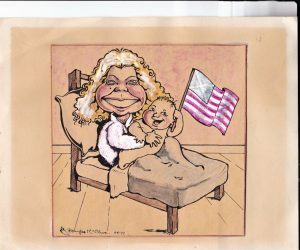 The birth of their first son, Bruce, was commemorated in this cartoon drawn by Derrick’s brother, Douglas. Dwight proudly displayed it on the wall over his desk in his home in Palo Alto. 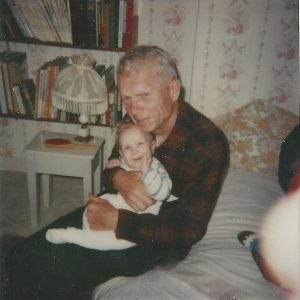 Ann’s father, Dwight, was very moved to be able to hold his grandson Alan. Dwight and his and Louise’s grandson, wee Alan, 1978. Dwight and Derrick shared common interests in language even if their areas of specializations were different and they enjoyed each other’s company. Dwight and Derrick enjoy an exchange of ideas. 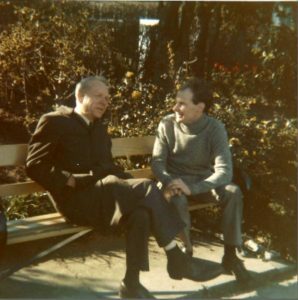 The photo was taken in Stewart Park near where the McClures lived. Ann and Derrick in the back row. Bruce, Alan, and Ewan in the front. 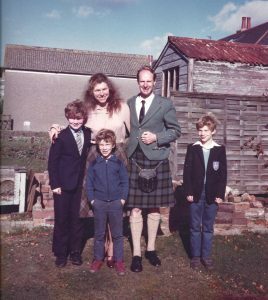 Picture taken in the back yard of their Aberdeen home. A family reunion in Palo Alto, California where Dwight and Louise moved after his retirement. Back row from left to right: Louise, Dwight, Ann, and Derrick. Front row from left to right, Ewan, Bruce, and Alan. 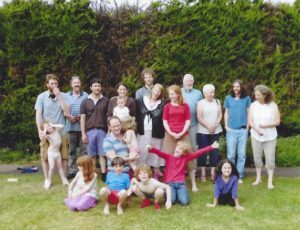 With Palo Alto, California and Aberdeen, Scotland separated by over 5,000 miles, family visits are not as often as the family would wish. 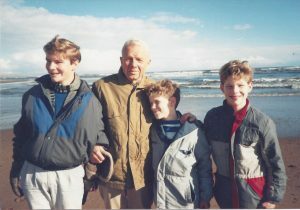 The McClure boys, Bruce, Alan, and Ewan with their grandfather Dwight on a walk along the beach north of Aberdeen. 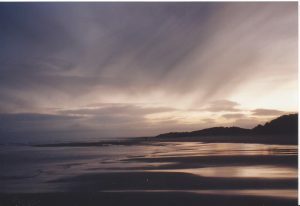 Late afternoon on the beach near Aberdeen. 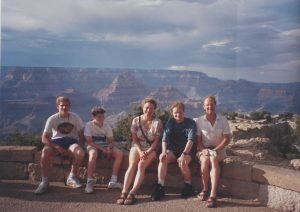 Ann, Derrick, and the boys (Ewan, Alan, and Bruce), Grand Canyon, 1992. 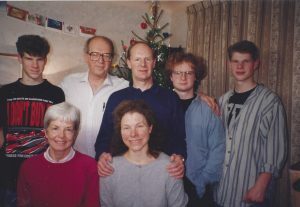 Reunion in Scotland, Christmas 1994. Back row: Alan, “big” Bruce, Derrick, “little” Bruce, and Ewan. Front row: Charlotte and Ann. 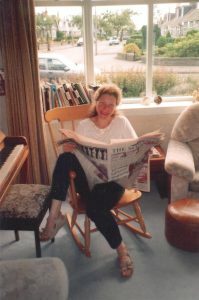 Drawing of Ann in 1995 by her son, Ewan McClure, at age 20. The four caballeros. 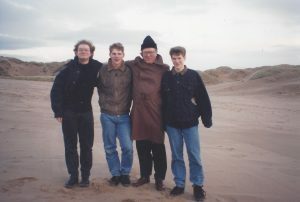 From left to right, “little” Bruce, Ewan, “big” Bruce, and Alan, 1997. 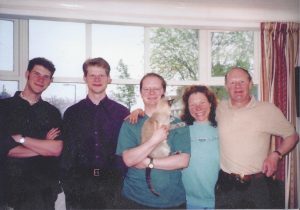 Alan, Ewan, Bruce, Ann, and Derrick with Siamese cat. 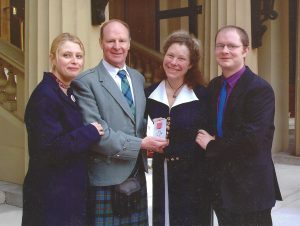 Derrick receives the MBE in 2002 for contributions to Scottish culture, the decoration being presented by Prince Charles. Ann and Derrick on a social occasion. 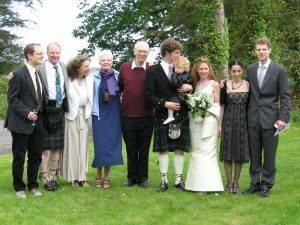 Wedding of Alan McClure and Michelle, 2007. 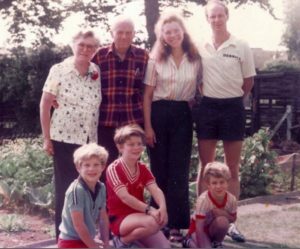 From left to right: “little” Bruce, Derrick, Ann, Charlotte, “big” Bruce, Alan, Fergus, Michelle, friend of Ewan, and Ewan. 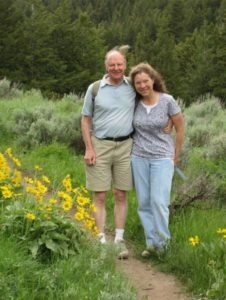 Derrick and Ann, Jackson, Wyoming. Trip to Yellowstone, June 25, 2011. Derrick and Ann, New York 2015. 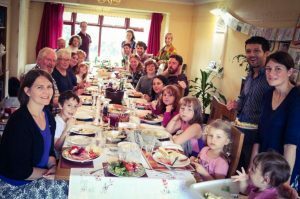 Family reunion in 2017. Three generations! 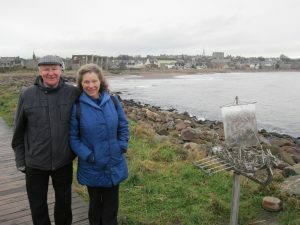 Derrick and Ann taking a walk along the beach at Stonehaven, Scotland, a little south of Aberdeen, December 2017.